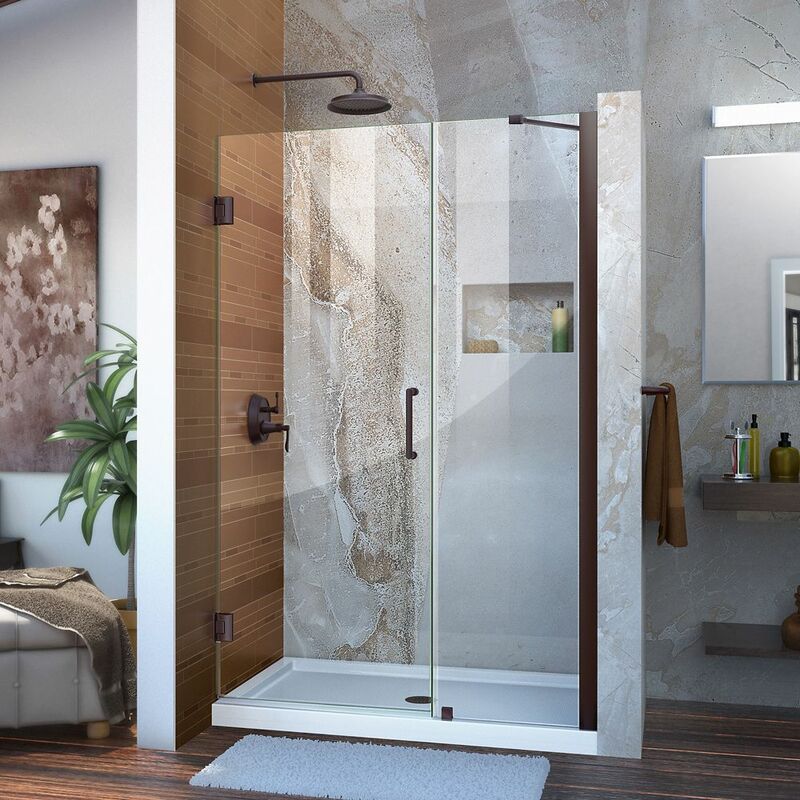 Unidoor 47-inch x 72-inch Semi-Frameless Hinged Shower Door in Oil Rubbed Bronze with Handle is rated 4.4 out of 5 by 5. Rated 5 out of 5 by BigDaddy from Excellent Shower Door I am a DIY'er and I installed it myself with the help of the manual. Anyone can install this as long as you can pick up the door (it's heavy). The quality of the door was excellent. I appreciated having the extra hardware they provided w/ the kit (I almost stripped one of the door screws installing it). This just proved to me that they want the customer to be happy with their product and I was. Some things to note: Its helpful to have another person there to hold the door to measure and mount but not required. The manual is descent but found myself looking things up online because it wasnt covered in the manual. No where in the manual did it discuss any of the door frame mounting gaskets. Use them as they were provided in the kit. The door is very heavy so make sure you have wood studs to mount the door frame screws too. The manual says to sink them in the framing 2X4's but the pictures show using the wall anchors. Dont use the wall anchors on the door! Also there was no waterproof gasket provided for the piece that anchors the side glass to the curb. Make sure to use plenty of silicon sealant on the screw hole and the underside of this piece to prevent water penetration. Overall.... I would buy this Unidoor shower door again. They make an excellent product! Rated 5 out of 5 by cappy13 from love my shower door!! This door is exactly what I was looking for. The price is unbeatable compared to other glass doors out there.